Benelli’s six-cylinder Sei, in either 750 or 900cc flavor is a very cool machine. Styling is disappointingly conservative and the handling basically average, but you really buy this bike for the glorious engine: it’s flexible, reasonably powerful, and makes an expensive shriek as it revs, a sound that has often been favorably compared to the wail of a vintage Ferrari. 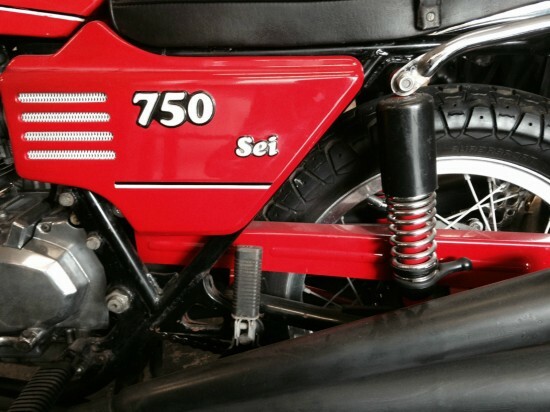 Introduced in the early 1970’s, the Sei was Benelli’s flagship model, an elegant grand touring motorcycle with exotic specifications, performance, comfort, and subtle good looks. 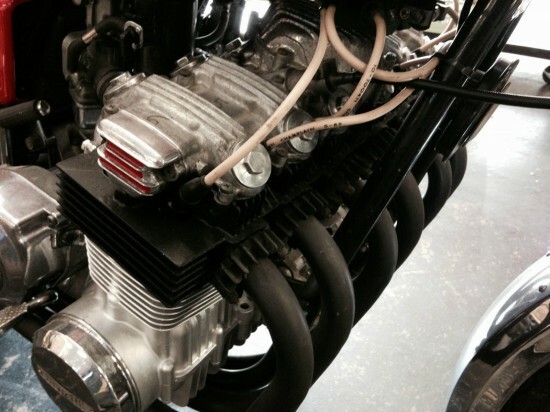 The early 750cc version put 71hp through a 5-speed gearbox and could push the unfaired machine all the way to 126mph. The wide engine does create some packaging issues, although the six-into-six exhaust probably causes more cornering clearance issues… But maximum lean is hardly this bike’s intended mission. It was a statement, a halo-model designed to show that Benelli could compete on the world stage against the Japanese manufacturers. Unfortunately, they didn’t really have the manufacturing muscle to back up its intended mission. It was well-received by the motoring press, and an update to 900cc’s in 1979 kept the bike relevant, but the bike never really sold very well. I purchased last year from the original owner and had Perry from Perry’s motorcycle and sidecars in Ft Worth Texas (Who used to sell and service these new) go through it, sort it out and bring it back to life, it’s purring again. Starts right up and runs well now. I believe it still has original tires though! This has been on display in my shop all year and now I have decided to sell because I need the space and have my eye on something else. It is an original bike including the pipes which have been painted black. The mileage is correct at 4358 miles. The paint is in above average condition on the tank and original, especially for being almost 40 years old. There is a small indention in the tank on the bottom near the seat, not the sides of the tank This doesn’t really bother me, however if you decided to repaint the tank, you would certainly fix this. All badges are original. It’s pretty stunning as it sits. The bike doesn’t really leak either. The inside of the tank has been coated and the brakes have been gone through by Perry, when he went through the engine and the carbs. It is setup for a battery tender. It has the original wheels and brakes. It is the dual disk front , drum rear brake version. Im sure Ive left off a ton of detail. Please ask and I will answer to the best of my ability. 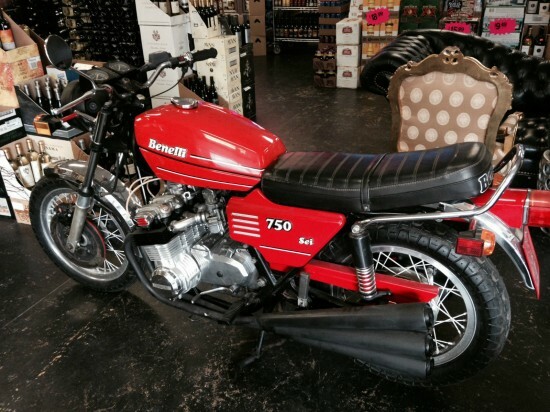 This is basically an un-restored beautifully aged Benelli 750Sei with all the original bits. Includes old factory service manual and old factory parts manual. So often, these bikes fall into disrepair: like an 80’s Alfa Romeo, they’re relatively cheap to buy but mechanically complex and pricey to run, leading owners to neglect major services until the bike fails in some fundamental way. Then they’re left with an expensive project in need of parts that haven’t been made in 20 years or more, and the finished bike will only be worth a fraction of what’s been invested. So into the back of a shed it goes. 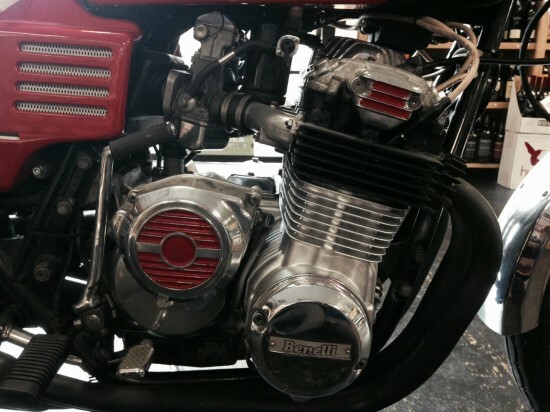 Any six-cylinder motorcycle is going to be an expensive proposition: Honda’s CBX is costly to run: no matter what part you need for your motorcycle, there’s a good chance you’ll need more of them for your six. Benelli’s questionable status in the modern market and lack of cache in the collector market has kept values relatively depressed for the marque, outside of racing machinery. 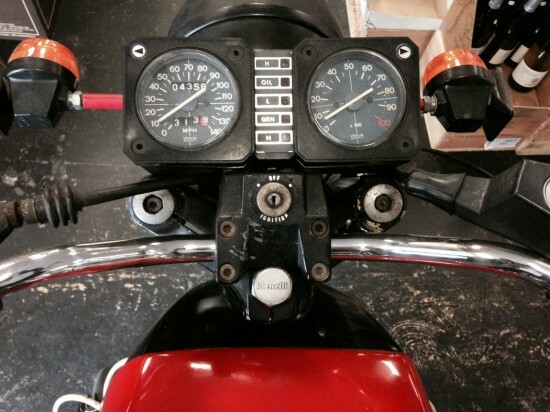 This particular example appears to be clean and well-maintained, with very low miles for a bike designed to cover miles in class and comfort. Bidding is active, and is at $5,700 with five days to go. If you’ve got room in your garage and have a hankering for Benelli’s techno tour-de-force, keep an eye on this auction.